It's Sally Gunnell running a mile for Sport Relief! If you're wondering why she looks so knackered, it's because she usually only does 400m (and a couple of hurdles). 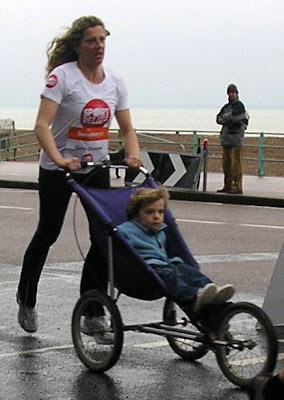 At the halfway point, she forced the kid to swap places and push her. Well ok, she didn't. In fact I can personally confirm that Sally completed the full 1600m course along Madeira Drive this afternoon with no outside help whatsoever. Unless you count the presence of local football mascot Gully the Seagull coming up behind her. That would certainly have made me run faster. Anyhoo, the selfless physical exertion proved to be well worth it. Just look at the rapturous reception she received from the capacity crowd in the background. To be honest I only went down there to meet Theo Paphitis from Dragon's Den and ask him to lend me a fiver, but by the time I arrived he'd scarpered with all his money and left me with the likes of Sally Gunnell, Fatboy Slim and the Mayor, who'd swapped her gold cheongsam for a t-shirt, and was busy telling the crowd that you don't feel quite so cold once you're out there, whilst smiling weakly and looking for her coat. I bet she can't wait for the end of her term of office. I'm glad to have done my bit anyway. I didn't run the mile or give any money, but I've mentioned it on my blog. It was the least I could do. In other news, I think I might be on the verge of being arrested for shoplifting. I went to Lidl last night for some cat food (which frankly is so cheap it's not worth stealing), and having made it through my 60-second trolley dash without being mugged by someone from the Whitehawk estate, I paid for my quality products and was about to leave when the man on the till mumbled "Would you like some free bread?" and pointed to a large crate of loaves nearby. I said "Is the Pope Catholic?" (well ok, I said "Oooh, thanks! "), helped myself to three loaves of Kingsmill, and walked out the door. I assumed the bread was already so far out of date that they couldn't even charge 5p a loaf without scraping off the mould first. To be honest I never had any intention of eating it, I'm just incapable of turning down anything free. It wasn't until I got home that I looked at my haul and found that it's actually two days within date and perfectly fresh. So I'm now beginning to think he said "Would you like some lovely bread?" in a polite, friendly 'Do you want fries with that?' kind of a way, and as we speak, they're examining CCTV footage of my getaway. It's just as well I'm leaving town in the morning.